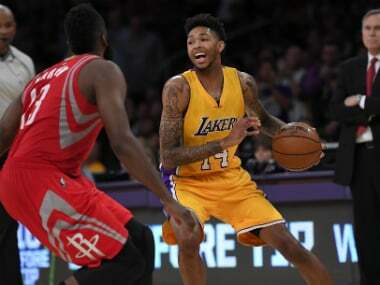 Los Angeles: The new-look Los Angeles Lakers, with Kobe Bryant retired and coach Luke Walton at the helm, opened their NBA season with a 120-114 victory over the Houston Rockets on Wednesday. Jordan Clarkson came off the bench to score 12 of his 25 points in the fourth quarter. D'Angelo Russell scored 20 points and Julius Randle added 18 points, seven rebounds and six assists for the Lakers, who overcame James Harden's 34 points and career-high 17 assists for Houston -- who lost in former Lakers coach Mike D'Antoni's first game in charge of the Rockets. "It feels good," said Walton, a former Laker who cut his coaching teeth as an assistant to Steve Kerr at Golden State. "It feels really good. The guys really fought tonight. A big part of what we're trying to do here is develop this identity, this culture ... learning how to win games is a skill at this level. We did some things that could have cost us the win at the end of the game tonight, so obviously we can learn from that -- and that fact that we still got that win feels really good." Walton admitted to "nerves and excitement" before the contest, but was buoyed by the presence of his father, former NBA star Bill Walton. 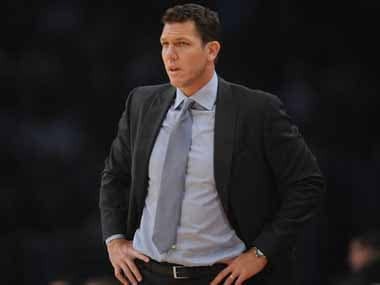 "The Walton force will be strong tonight," said the 36-year-old coach, who has been tasked with turning around a Lakers team that plunged to a 21-61 record in 2014-15, only to follow up with a franchise worst 17-65 campaign last season. Two free throws from Clarkson lifted the Lakers to a 108-104 lead with 6:41 to play. But Harden converted a pair of foul shots with 3:53 left to knot the score at 110. Two Russell free throws boosted the Lakers to a 113-112 lead with 2:47 remaining and the hosts wouldn't trail from there. The Rockets, who led by as many as 10 points, grabbed a 71-63 edge at the half. They connected on 64.4 percent of their shots compared to 53.2 percent for the Lakers before the break. 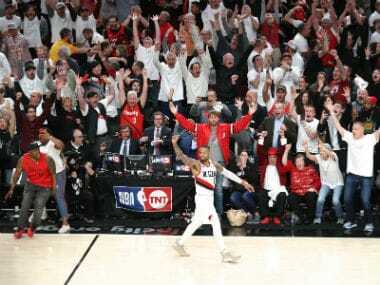 "I was real proud of the way they accepted the challenge in the second half," Walton said of his young team, "real proud that they stuck with it." 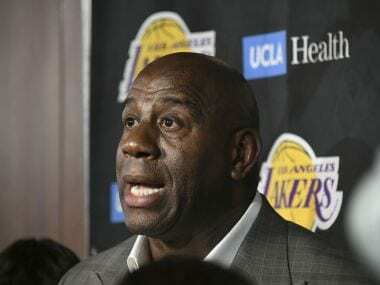 While the Lakers are in rebuilding mode -- embarking on their first season since 1995 without superstar Bryant -- there was plenty of glamour at Staples Center, where Hollywood stars Jack Nicholson and Denzel Washington were among the crowd, as was NBA commissioner Adam Silver. "We're just going to go out there and fight every night and play the right way," Randle said of the Lakers' expectations. "That's all we can promise -- to get better every day and play the right way." The Miami Heat, forging ahead after the free agent departure of Dwayne Wade, opened the season with a 108-96 victory over the Magic in Orlando. The Heat made up for what they lack in star power with energy, a well-balanced attack and determined defense. Hassan Whiteside scored 18 points, pulled down 14 rebounds and blocked four shots. "We need Hassan to be great, and he was when we needed him," Heat coach Erik Spoelstra said. "He really anchored us defensively and ignited everyone out there." Six Heat players scored in double figures and six players notched at least six rebounds. "It's just game one, so it's early, but you're starting to see the foundation we want to build," Spoelstra said. "Guys really have to buy into the concept for this to work. You enjoy when it's being played the correct way out there." The Oklahoma City Thunder, also adjusting to the departure of a star after Kevin Durant signed as a free agent with the Golden State Warriors, leaned on Russell Westbrook in a 103-97 victory over the Philadelphia 76ers. In Toronto, DeMar DeRozan poured in 40 points to lead the Raptors to a 109-91 victory over the Detroit Pistons. 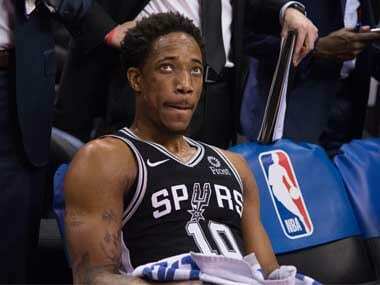 DeRozan connected on 17 of 27 shots from the field and six of six free throws in what coach Dwane Casey called "one of the most efficient" performances he'd seen from his star. A monster 50-point game from New Orleans' Anthony Davis couldn't save the New Orleans Pelicans, however, as they fell 107-102 to the Denver Nuggets.